KARANGASEM, Indonesia — Bali's gently lowing cows, prized for their hardiness and doe-like temperament, won't become victims of the tropical island's menacing Mount Agung volcano if villager Wayan Sudarma has any say in it. 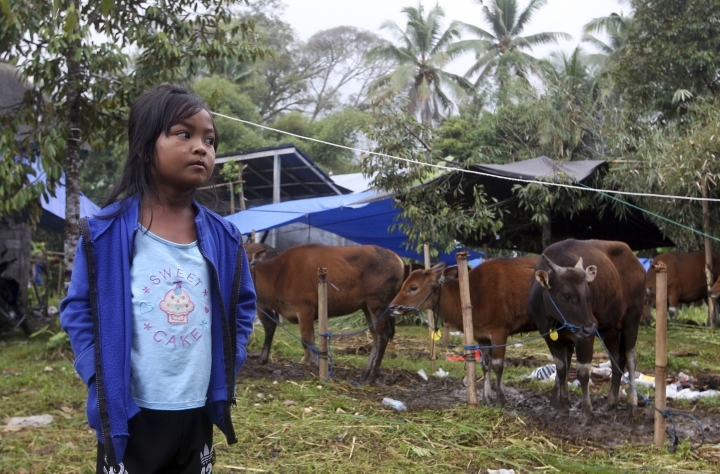 A proud owner of 21 cows, Sudarma has been venturing daily into the no-go zone around the Indonesian volcano on a mission to rescue at least some of the estimated 20,000 cattle still grazing on its potentially lethal slopes. Experts say that is highly risky. Fast moving hot clouds of ash, gas and rock fragments that explosive volcanoes such as Agung can expel would kill in seconds. But Sudarma, who drives a past-its-prime truck into the so-called red zone to pick up cows when contacted by other villagers, said he isn't afraid. "These are the only valuable belongings that are left in this situation," he said as some of the rescued light-brown beasts lounged behind him, chewing their cud and mooing contentedly. "That's why we have to save them, so they can sustain our lives as farmers and remain our pride." Authorities set the volcano's alert status to the highest danger level on Sept. 22, and warnings it could erupt anytime have sparked an exodus of more than 140,000 people. Left behind, disaster officials estimate, were about 20,000 cattle. Another 10,000 were sold or taken with communities as they left during the panicked evacuations that followed the order to evacuate a radius around the volcano that extends to 12 kilometers (7 miles) in places. 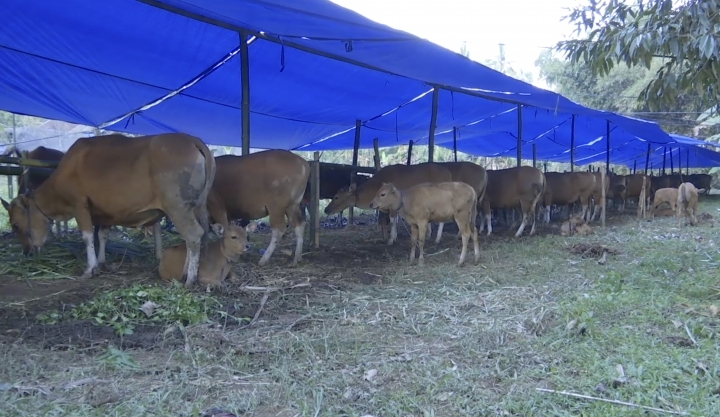 Local government officials say they hope the shelter Sudarma is bringing cattle to will save villagers from big economic losses. Those that sold their cattle in a rush had to let them go for too little, they say. Predominantly Hindu Bali is known for beaches, surf, artistic culture and a lush green interior that lures millions of visitors a year. And while tourism is an economic mainstay, farming is still crucial for many. Bali cows are particularly valued by villagers because they have high disease resistance, grow well on low-quality fodder and are temperamentally suited to close-quarters living with people and plowing. Veterinarian Wayan Gunawan, who has also been going into the danger zone to help with cow evacuations, said the shelter will stop his district's cattle population from collapsing. The slender vet admits to some trepidation about getting close to the cone-shaped volcano. "Deep inside, as a human being, of course we are afraid," said Gunawan. "But this is our duty. Our duty is to help the farmers with their cattle so they won't lose too much." Scientists say Bali cows, found on several islands in Indonesia, are valuable genetically because they're a unique combination of bovine species that could be transplanted to other tropical regions. The shelter, one of several set up, can hold up to 700 cows and currently has a little over 200 bovine residents. "I'm really glad there's such a place," said Sudarma, before he climbed into the cab of the truck. "This place is the safest place for the cattle because their health and food is being taken care of by the local government," he said. 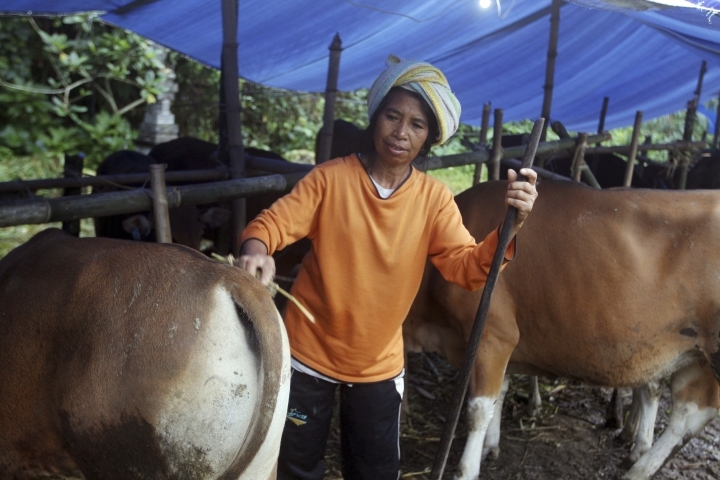 "The point of putting them here is to save the Balinese cow."